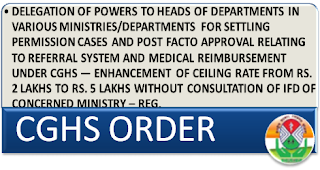 Subject: Delegation of powers to Heads of Departments in various Ministries/Departments for settling permission cases and post facto approval relating to referral system and medical reimbursement under CGHS — Enhancement of ceiling rate from Rs. 2 Lakhs to Rs. 5 Lakhs without consultation of IFD of concerned Ministry – Reg. The undersigned is directed to refer to this Ministry’s OM No. S.12020/4/97-CGHS (P), dated 27.12.2006 and its clarification issued vide this Ministry’s OM No. S.11011/20/2014-CGHS (P), dated 20.06.2014, wherein financial powers were delegated to the Heads of Departments/Ministries to settle all such cases where there is no relaxation of rules involved and admissibility of claim was worked out with reference to the CGHS approved rate list and guidelines. 2. This Ministry has been receiving requests from different Ministries/Departments for enhancement of delegation of financial powers to Head of Departments to settle medical claims/medical advance cases involving financial implications upto Rs. 5 Lakhs without referring the case to Internal Finance Division (IFD). 3. The matter regarding enhancement of delegation of financial powers to the Heads of Departments/Ministries has been examined in this Ministry and it has been decided with the approval of the competent authority to enhance the existing limit of Rs. 2 Lakhs to Rs. 5 Lakhs to settle all cases where there is no relaxation of rules and the entitlement was worked out with reference to the rate list prescribed. In respect of cases involving payment exceeding Rs. 5,00,000/- (Rupees 5 Lakhs only) but as per the prescribed rate list, the concerned Departments/Ministries may settle such cases in consultation with their respective Internal Finance Division. Only in those cases where the settled scheme/rules are required to be relaxed, should the case be referred to the Ministry of Health and Family Welfare. 4. This issue with concurrence of Internal Finance Division vide FTS No. 91725, dated 01.11.2016.